Heard murmurs a while back about the possibility of an international inquiry commission into abuses in Burma, the country also known as Myanmar about which IntLawGrrls frequently have posted. 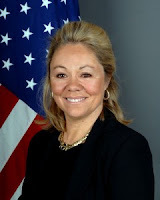 A statement that Ambassador Eileen Chamberlain Donahoe (below right), the U.S. Representative to the Human Rights Council, made in Geneva Friday (hat tip) confirms that such a possibility is on the table. 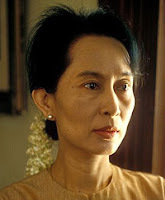 In Burma, the human rights situation remains grim. Under the repressive election laws that stifle meaningful competition and with the continued detention of more than 2,100 political prisoners, including Nobel laureate Aung San Suu Kyi, the November 7 elections cannot be inclusive or credible. Our overriding objective is to promote a peaceful democratic transition, encourage national reconciliation, and achieve respect for human rights. We urge an end to systematic violations of religious freedom, notably the large-scale repression against the Muslim Rohingya, including refusal to grant citizenship, severe government restrictions on travel, and discrimination in employment and educational opportunities. Finally, six months ago Special Rapporteur Ojea Quintana invited consideration of a commission of inquiry. The United States believes a properly structured international commission of inquiry that would examine allegations of serious violations of international law would be warranted and appropriate. My government is examining how best to proceed on this initiative. Worth noting that Ojea Quintana's report made specific reference to the International Criminal Court. Past such commissions have been deployed in places like the former Yugoslavia and Darfur. The resulting Yugoslavia report, issued by a commission chaired by M. Cherif Bassiouni, and the Darfur report, issued by a commission chaired by Antonio Cassese, both led to international criminal cases. No less an authority than Philip G. Alston, the NYU Law Professor who recently concluded a term as Special Rapporteur on extrajudicial, summary or arbitrary executions, has recommended such commissions as "an appropriate filtering mechanism" in order to "evaluate whether or not a situation warrants referral to the ICC." Worth watching what happens with this proposal.